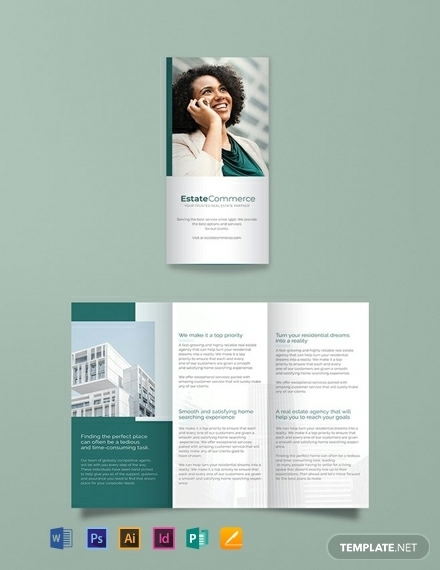 If you are looking for some examples of commercial real estate marketing materials to add to your arsenal, this list is for you. Check out the following examples, download an option that’s suitable for you, and then use it where necessary in your marketing campaign. 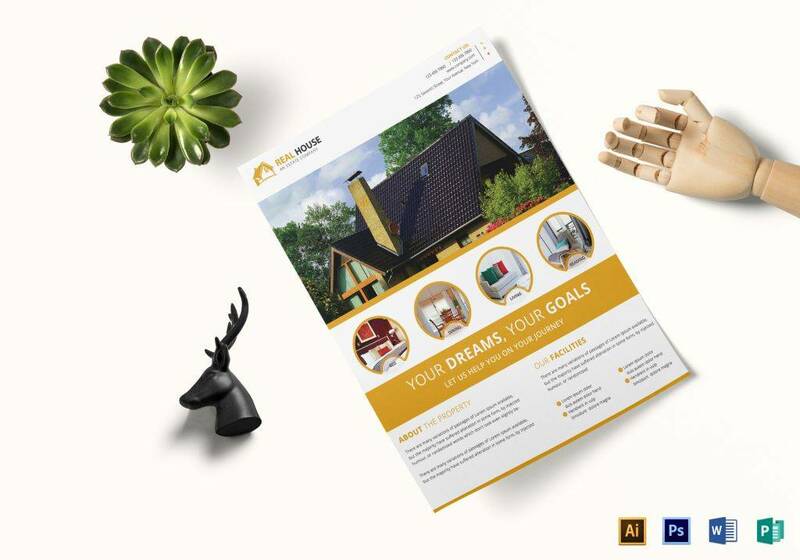 A flyer is unique stationery to add to your real estate marketing arsenal. 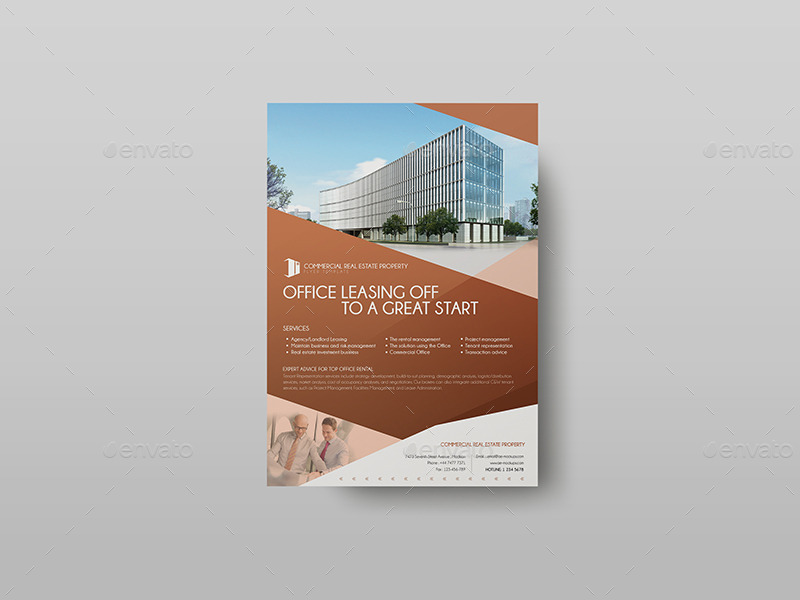 Known as one of the least expensive marketing materials, this flyer will enable you to market existing commercial properties to customers for lease or sale. The design is simple, yet the template appears so elegant that it can grab the attention of the target audience with ease. The print-ready is definitely up to the standard. And, while some real estate agencies or brokers may wish to tweak elements like fonts and/or color, the initial design is good to use exactly as is. Use this flyer to share important housing information with your audience. Marketing a new commercial real estate listing to an existing market doesn’t have to be expensive. 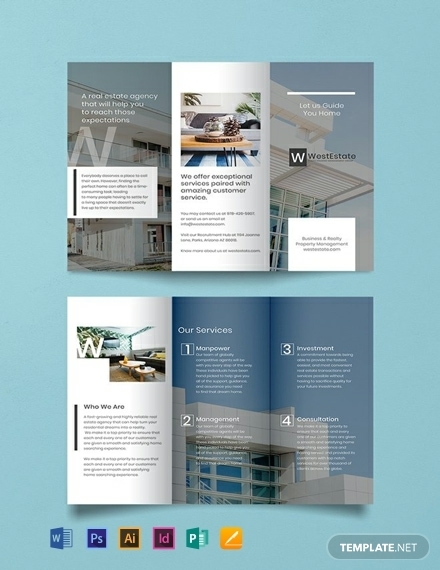 If you are on a limited marketing budget, or you are just looking for a low-cost option to get the words out there, you can use this brochure. Brochures, like this one, aren’t just cheap, they are also easy to distribute. More often than not, you are able to reach a wider market in a variety of locations, particularly because a brochure is easy to distribute. Since this commercial real estate brochure can help you expand your reach, you have the opportunity to share information with more people, meet more potential customers, and possibly increase monthly sales. With families, startups, and small business owners looking for premises to buy or lease, there is a very big real estate market out there for you. 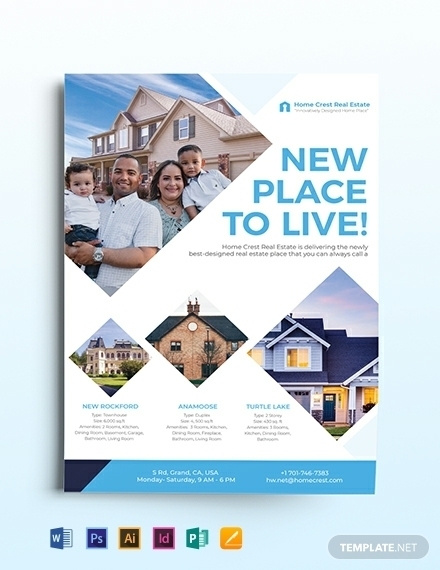 Whether you are a broker, an agent for a corporate real estate company, or a small real estate agency, you can easily reach out to this market with a personalized rack card. This template is suitable for direct marketing. That’s because it allows you to capture the attention of your target audience better than an internet advertisement can. You can distribute the rack cards solo, or you can hire some helping hands to help you with the distribution. Nothing makes real estate marketing fun like having a direct encounter with a target audience. The face-to-face communication in the event of a meet up gives you the opportunity to share a lot about your corporate real estate agency. You better place the most important information in a marketing brochure. And here is an example template that will help you do that. Since the template is available in different file formats, from Photoshop and InDesign to Pages and Microsoft Word, you can edit/customize it according to your choice. Do you have a new home that you would like to promote? Or maybe you have a recently evacuated business premise that you would like to advertise for lease? You can use this commercial real estate flyer to advertise the property to a target audience. 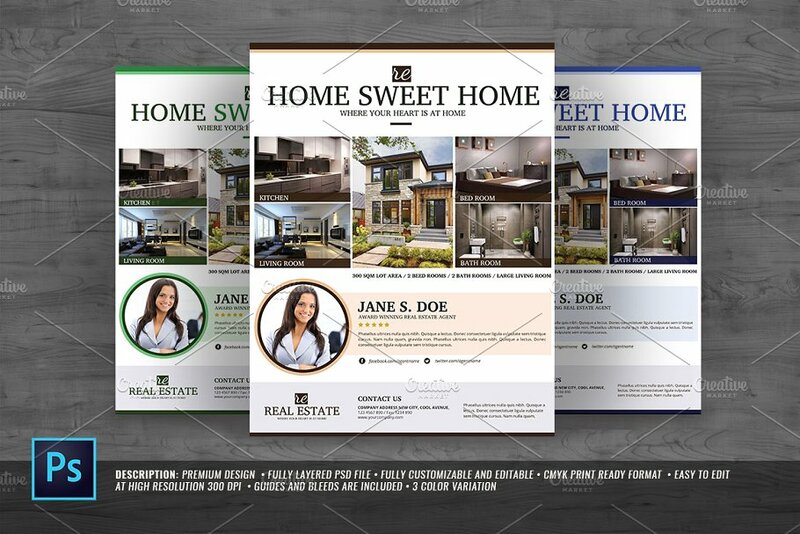 Divided into customizable layers, this flyer template lets you display different parts of the property in question, so a potential client can see different parts of the premise before an actual visit. The top left section of the flyer features a logo area where you can add your real estate logo for agency branding. Use the rest of the layers to show images of the property that you would like to promote, plus a unique description of the features. Commercial real estate marketing is an art that, if well planned and executed, can yield you reasonable return on your investment. At the end of the day, you need a winning marketing plan that can help you to grab the attention of the target audience and convert prospects into buying customers. 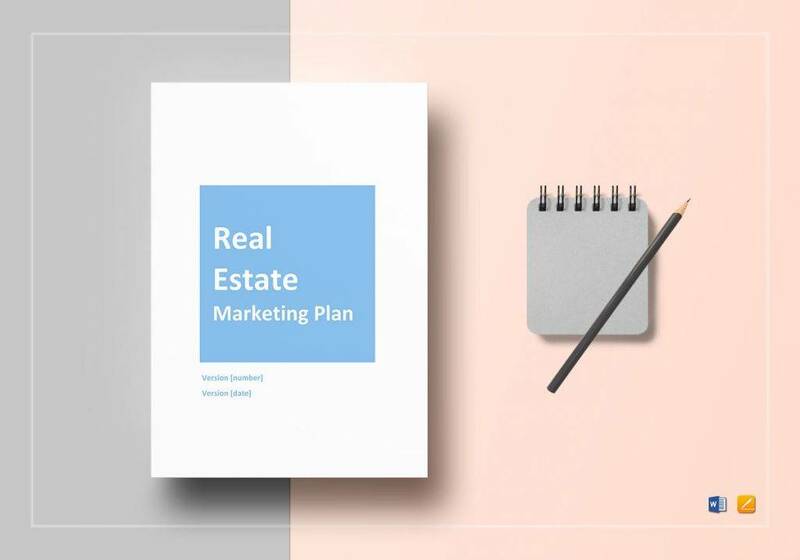 With the help of this real estate marketing plan template, you can create a unique approach that will enable you to get in touch and market to your target audience with ease. This sample template will help you to evaluate your business and buyers’ needs. With a marketing plan, you are able to understand the buying options of your prospect, particularly why they are likely to buy from you and not your competitors. Are you the person who likes to use a marketing flyer as part of your real estate marketing tools? Or maybe you are looking for the most affordable marketing materials and you can’t help but think about using a flyer. Whatever the case, you can use this marketing flyer to get in touch with your audience and show them what you have to offer. Remember, real estate prospect want to know more about the features and benefits of a home. This enables them to determine whether the listed premise in question, whether for sale or lease, is worth the asking price. As much as marketing flyers are easy to design, they still take up a very big part of someone’s time. And if you are in real estate business, you know you had better focus more on marketing than design. 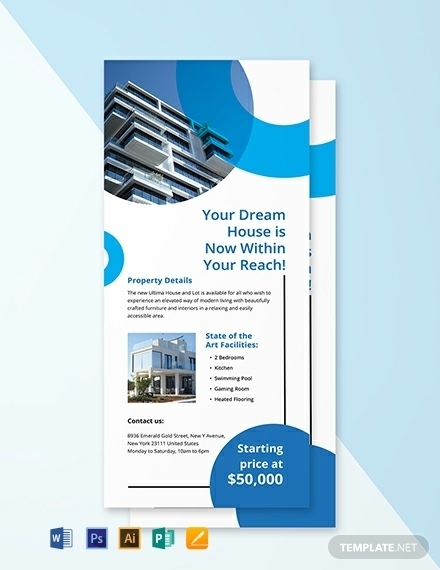 That’s why this real estate marketing flyer is a good option to consider for your marketing campaign. A real estate logo is an important tool to add to your marketing materials. You can add it on a flyer, an email newsletter, an email signature, a brochure, a roll-up banner, and even on banner ads. It helps to create a brand identity. 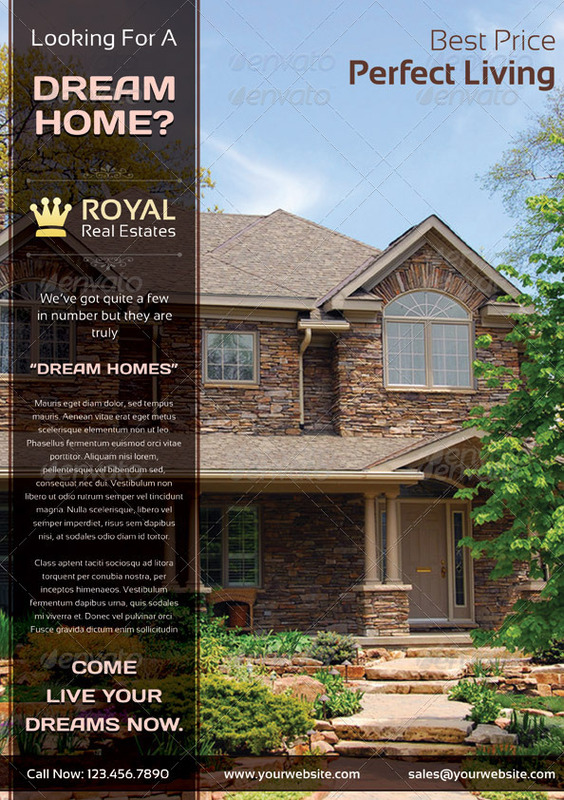 Take advantage of this royal estate real estate marketing flyer and use it to promote an existing premise for lease or sale. The template is fully layered and easy to edit in Photoshop.